My Life, Starting Up: Should I Worry About Pandora's New Advertising Model? Should I Worry About Pandora's New Advertising Model? I was listening to my Pandora station this morning and something happened that's never happened before. My station was interrupted with a commercial. It was a 2 second sponsored ad telling me I could find out how their music genome project works. I wasn't that bothered. It was 2 seconds. And I actually clicked on the video to see how it works. It was really interesting. It took me through a scenario of how I could be shown some Elvis Costello music if I liked a Kanye West track. I don't mind the occasional interruption if it's this short, but what worries me is if this 2 seconds extends into 30 second spots. Advertising on the radio just seems to be getting longer and longer. I switch the station when ads start because it's so annoying. Almost as annoying as when the volume of television ads goes up during commercials. But this really got me wondering if the offline model of ad supported radio is just too proven to stray from on the internet? 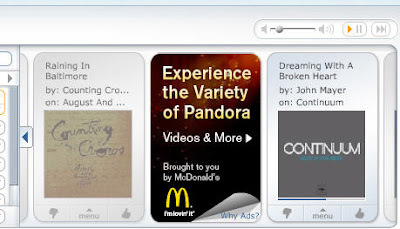 Are all online stations going to be ad supported soon? Is there any other model that can make money? Will online and offline radio converge at some point? Wouldn't a radio in your car with different Pandora stations be so much cooler than listening to KFOG? Or WBCN? And sure, you can pipe in some news and talk radio if you wanted. I'm surprised that audio advertising is really the only way to make money with music stations online. With all this technology going on you'd think it'd be different.